The Oly Mountain Boys | Pacific Northwest Bluegrass | Blog : Big bluegrass plans for 2014! Big bluegrass plans for 2014! The Oly Mountain Boys are excited for 2014. We have our most ambitious plans yet for next year, and we're going to need your help to pull it all off! 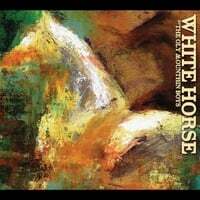 Our next album, White Horse, is going to be like nothing we've ever attempted. The music is coming together but we're not stopping there. The album's songs tell the life story of Charlie McCarver, a character that lived in early 20th century Washington. To further enrich the story and the character, we sent out over 20 packets to writers and artists who will contribute their work to a booklet that will accompany the album. We think there's a lot of reasons to be excited about this concept - it unifies music with other art forms, and weaves it into a picture of Washington history. And as far as we can tell, nothing quite like it has ever been done in the bluegrass world before. We're hoping you'll tell folks about it so we can unlock the full potential of this idea. A big reason to spread the word about this album is that we're going to need your help to get across the finish line! We'll be launching a pre-order campaign through Kickstarter near the beginning of February. Keep an eye out for it and make sure White Horse gets made! We're excited to announce that we'll have the opportunity to take the show on the road in February! We'll be doing a quick Valentine's / President's Day weekend tour between the 12th and the 16th. We'll hit Ashland OR (thanks to Eight Dollar Mountain! ), San Francisco CA (with Windy Hill! ), and then on to some weekend gigs in the San Luis Obispo area. Spread the word (forward this email!) down to California - the Oly Mountain Boys are comin to town! FRIDAY JANUARY 17th, 9:30pm - Doyle's Public House, Tacoma WA. SATURDAY JANUARY 18th, 8:30pm - Robin Hood Restaurant & Pub, Union WA. FRIDAY JANUARY 31st, 7pm - The Blue House Concert Series, Olympia WA. Contact us for details. SATURDAY, FEBRUARY 1st, 8pm - South Bay BBQ (Pig Bar), Olympia WA. Ring in GroundHOG's Day at the Pig Bar! Our Oly sendoff before hitting the road! P.S. Thanks to Insanity Shack Design Studio for our new logo!